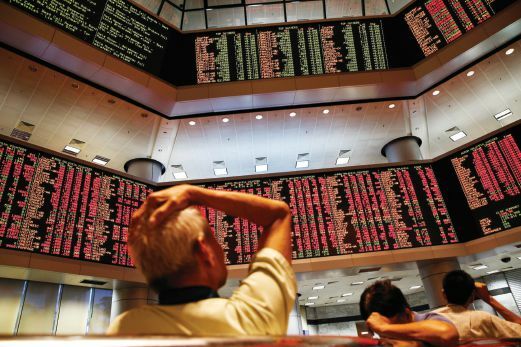 During the days of the Kuala Lumpur Stock Exchange, it was the ‘buy on rumour, sell on news’ investing strategy that had everyone, from approved investors to housewives, running to banks to jump on the bandwagon. ANOTHER episode of the “good old days”, rightly or wrongly, of stock market investing came to an end slightly more than a week ago with the sentencing of the once golden boy of securities trading, the former Repco Holdings executive chairman, Low Thiam Hock, or Repco Low as he is better known. Low is going through the due process of law and appealing his sentence at a higher court. We shall leave him, and his case, at that. But, the mention of his name brought back memories of the days when the then Kuala Lumpur Stock Exchange (now Bursa Malaysia) could either be what to the old Norse mythology was Valhalla, or in an instant, a killing field littered with broken dreams. It was a period when the investing strategy of “buy on rumour, sell on news” was adhered to as a sacred guide and where the word “fundamental” was just another one that began with the letter “f”. People spoke of initial public offers (IPOs) a lot more than they spoke of food then, never mind that most knew next to nothing about the companies whose shares they were vying for. What was important was their applications were among those balloted as being successful before they waited, always impatiently, for the stocks to be quoted on the exchange. From housewives to some “approved investors” running around banks with their pink forms of blocks of securities to pledge against ever willing share trading financiers, they all hoped for nothing less than capital gains. Most of the time they won as even the sheer magnitude of over-subscription rates in the IPOs themselves pointed to money already waiting somewhere in the horizon. We had numerous “market movers” then, individuals with the so-called Midas touch, who in turn led hordes of retail investors in taking whatever positions they took on a stock. Few really bothered to look into the telltale signs of companies’ health such as the numbers in their balance sheets. The strategy was simple as it was straightforward, and at times outright reckless. If so and so were buying the stock, something must be brewing and other investors should jump onto the bandwagon. This Midas-spotting strategy tend to work well for companies with relatively small public share float as it was easier to corner their stocks, and, in the process, drive its price to levels that defied logic. I recalled at least one particular stock which was ignored by all when it was languishing at a worthless 80 sen a piece that suddenly attracted keen interest when an individual investor, whom I shall not disclose here, started buying it. The stock was trading at an incredible RM16 a share when the investor unloaded just a few months later. Many who bought when the price was climbing got caught when it dropped like a rock the moment the investor started selling. He, of course, made tonnes of money. And then there were other investment “dreamweavers” such as short selling, securities lending and margin trading. While these were legitimate investment techniques, retail investors with shallower pockets but big dreams were ill-equipped with knowledge of their potential risks. Most were purely driven by greed as they essentially traded shares which they did not own, and with borrowed money, and in the process exposed themselves to risks of becoming financial wrecks. Many got burnt as they bet wrongly as the margins they thought would last forever were exhausted, resulting in what was known as margin calls from their financiers. But perhaps, an equal number did get it right, too. A close acquaintance who indulged in such walking on thin ice investment activities paid cash for a condominium overlooking a golf course in the suburbs and lived happily ever after. He now sells imported used cars. Another made enough money to realise his lifelong dream of migrating elsewhere and now resides somewhere on the Pacific coast in Vancouver, Canada. But, like they often say, all good things must come to an end. And, just as in the saying among high stake rollers that the house eventually always wins, the market itself put everything in order. While some would argue that even in chaos, there exist opportunities, the government decided that enough was enough. The Securities Commission, which was formed from an amalgamation of a once fragmented regulatory structure in March 1993, bared its sharp teeth, and equally sharp claws. Its coming into being reminded me of the day when former Bank Negara governor, the late Tan Sri Jaffar Hussein, called in on bosses in a then loosely regulated and problematic Malaysian insurance industry, telling them, “gentlemen, the party is over”. It was soon after the central bank took over the industry’s supervision from the Treasury. Exchange itself changed its name to Bursa Malaysia and worked towards making securities trading as transparent as possible. Low came from that era before the market stepped in to discipline investors and he was just one of probably many others. at the bottom of one’s trading account.